Ask The Ripped Dude: How Can I Improve My Abs Without Hundreds Of Crunches? Crunches and sit-ups can be boring, and they're not as effective as you might think. These five effective ab exercises might serve you better. I&apos;m tired of constantly working my abs on the floor: crunches, sit-ups, and planks. 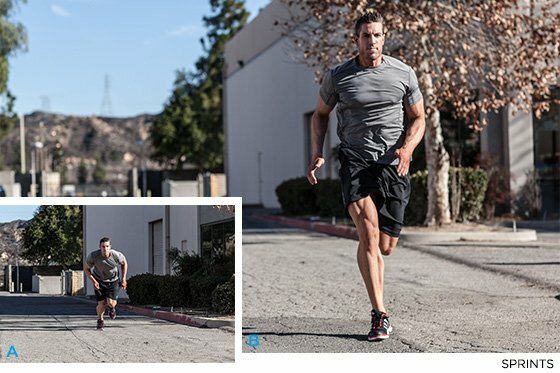 Do I need to do isolation movements or is my regular workout enough to build a strong core? Strength and muscle development is important, but nothing says, "Yeah, I&apos;m fit" quite like a six-pack. Ripped abs come from a perfect diet and tough training. Contrary to popular belief, though, you don&apos;t need to a million crunches to coax them from hiding. Your core is engaged no matter which version of squats you do, but holding the weight at the front of your body challenges the anterior core more than a back squat does. In order to do the movement safely and successfully, you have to engage your core. Without strong abs, the weight will bend you right over and win. Moreover, most of us are better at front squats anyway, because we train and use our anterior core much more than our posterior core. If you do add front squats to your regimen, you&apos;ll probably find it an easier movement than the back squat. If you don&apos;t feel your abs tighten when you do these, you&apos;re probably doing them incorrectly. If you didn&apos;t engage your core, you would just push the bar or pull the rope down by bending at the waist rather than using your triceps. Using your core to keep an upright position is called anti-flexion—your body uses it much more than you&apos;d think. The isolation and activation of your triceps during this movement is directly related to your core&apos;s ability to keep you from bending forward. Most of us use mountain climbers as a cardio movement. Although it&apos;s great for getting your heart rate up, it&apos;s also a good core exercise. Because it starts in a plank position, your core is automatically engaged in anti-extension, which means it keeps your back from hyperextending. It&apos;s doubly difficult because you also have to flex your abs to bring your knee toward your chest. These lifts are probably a staple on your back day. But, even if you don&apos;t realize it, they also work your core. To keep your body stable and upright, your abs work their anti-flexion skills. And, because you&apos;re loaded on one side, your core also tries to keep you from falling that way. This is called anti-rotation. To hit your lats correctly, your abs have to also do a lot of work. Not only are sprints great for fat-burn, they&apos;re an abdominal killer. Most isolation movements focus on just the six-pack muscles, but sprints hit the whole core. While you&apos;re sprinting, your abs have to constantly produce force to keep your body upright and your trunk stabilized. If you do multiple sets of sprints, your abs will spend a lot of time under tension working as hard as they can. Abs seekers usually try to spot treat their spare tire by working their abs several times per week doing crunches, sit-ups, abs machines—you name it. If you&apos;re already hitting your abs during your routine, is it really necessary to spend an extra 20 minutes fluttering your feet or repping out 100 crunches? Not really. There&apos;s no way to actually spot-treat, and the core strength and stability required to complete moves like a squat will tax the abs and help develop the washboard look you are after. If you&apos;d take the time you&apos;d normally spend doing ab isolation exercises on meal preparation, you&apos;d be better off. After all, no matter how much you work your core, you&apos;ll never see a six-pack unless your body fat is relatively low. If you really don&apos;t want to give up your ab routine, you don&apos;t have to. But you don&apos;t need to spend all day on it. Choose a few effective movements and focus on quality over quantity.